Often, to find out where your food comes from, you’ll have to check the back of the wrapper or ask your friendly produce man. Now students just have to check their backyard. 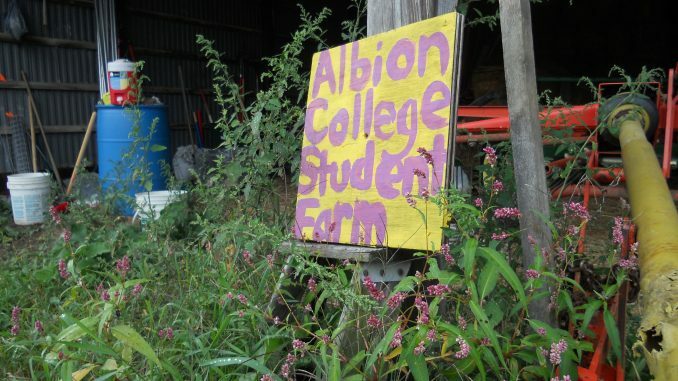 A group formed two years ago within the Center for Sustainability and Environment (CSE) and began the Albion Student Farm. Kaitlyn Pospiech, Grand Rapids junior, and Cody Yothers, Harbor Springs junior, worked on a FURSCA project beginning the farm, spending about 20 hours per week there. Finishing its second year on campus, the farm now aims to become more involved with the students and community. A majority of the harvest sells to Baldwin and a limited amount makes it to farmers markets. With about five to ten volunteers each harvest, the farm hopes now to be a larger and more active part of campus. Completely student based, the one-acre farm is able to experiment with what and how they want to produce their harvest. Students visited places like Michigan State University and Lawrence Tech University to learn and gather new ideas about small farming. Some of these ideas included bio-intensive planting and winter planning. While not certified organic, the farm has been all-natural from the beginning stages. No pesticides or chemicals are used in the farming, and they import fertilizer and compost from the equestrian center. They encourage natural methods for every option. Similarly, the farm worked with sustainable options alternatives to watering and early planting. Lauren Ridenour is a senior from Troy, Michigan, majoring in English and Anthropology/Sociology. Interested in features and campus issues, she has written and edited for the paper for three years.